Our projects are designed to be clear and fun to build and give you the best emotional contact with your gear. All our pedals have clear instructions and have been thoroughly tested and verified. We use the best parts from reputable suppliers (Neutrik, Panasonic, Texas Instruments, Atmel, etc). 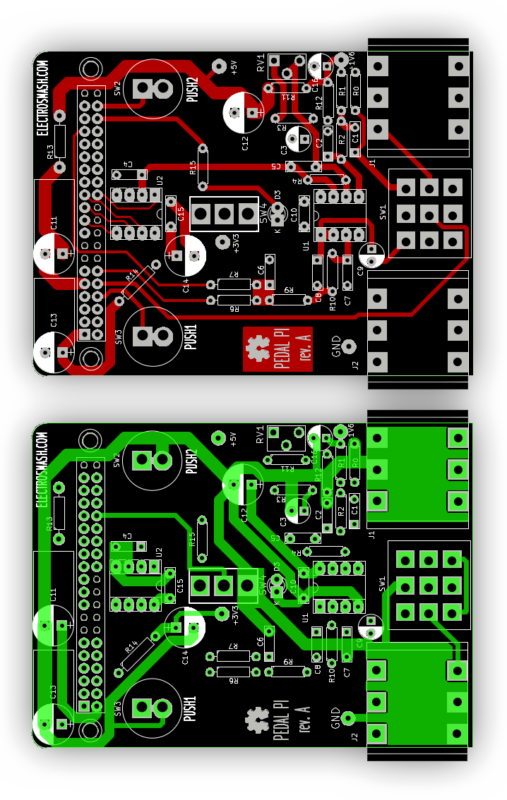 Our custom made printed circuit boards are designed for audio, paying maximum attention to the signal path. A good power supply architecture reduces the noise and enhances the audio performance. All the critical components are decoupled to ground and we use the best filter in every circuit supply. The signal path is kept as short and neat as possible, making it less prone to disturbances. The high-impedance tracks are kept as short as possible and all the return currents are taken into consideration. We try to improve the performance of our systems using the latest platforms like Arduino, Raspberry Pi, and 3D printing. All of them have a fantastic community and the learning curve is pretty easy.